Symmetrical Group is committed to conducting business activities in a manner that will safeguard the health and safety of its employees and of all persons affected by its activities, and that effectively protects the environment. Our goal is to achieve and maintain Occupational Health and Safety (OHS) performance excellence, as measured by our customers, industry peers, government regulators and our own internal targets. We are committed to providing the resources required to achieve this result. All levels of staff and management are responsible and will be held accountable for providing leadership, visible commitment, direction, resources and to minimize risk to people, plant equipment, property and to avoid process loss to meet our identified OHS performance target. Supervisors are responsible for ensuring that a safe work environment are provided and risks are managed effectively, that employees have been security cleared and are adequately trained so that our OHS policy and procedures are fairly and consistently enforced. All employees, contractors and others engaged by Symmetrical Group share the responsibility to work in a manner that will protect themselves, fellow employees and the public from harm. Employees are encouraged to consult with supervisors and participate in Health, Safety, and Environment (HSE) matters. Compliance with all applicable clients and/or governmental OHS regulations is considered the minimum acceptable standard of OHS performance. 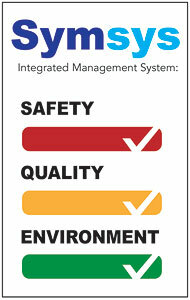 We will seek to continuously improve OHS performance and meet or exceed industry best practices. Active support of this policy is a condition of employment and an expectation of everyone we do business with. This policy has been reviewed and endorsed by the directors of Symmetrical Group who foresee benefits in, and take responsibility for, its successful implementation. The Symmetrical group abide to the standards AS/NZS 4801:2001 for Safety Management Systems. By accepting employment with the Company, each employee accepts that he/she is responsible for the application of this policy.